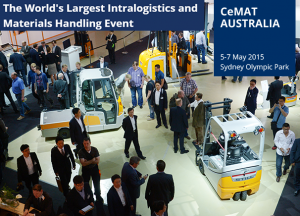 CeMAT, the global intralogistics and materials handling event, debuted in Australia yesterday at Sydney Olympic Park, attracting hundreds of visitors from around the country and the world to view a wide range of integrated and efficient approaches to materials handling and transport logistics. CeMAT concluded a successful first day of the three day show with colourful and interactive displays from exhibitors including Hyundai Forklifts, SeaBox International, hrd-Logistic Products, Lonking Holdings, DB Schenker, Knapp, adaptalift and Vivid Industrial, to name only a few. Mr Wolfgang Pech, Senior Vice President of Deutsche Messe, owners of CeMAT said that the key themes for CeMAT AUSTRALIA are the hot topics for the fast moving and evolving intralogistics industry. Topics such as the Internet of Things and E-Commerce are vital in ensuring the industry adapts integrated solutions and better ways of introducing new technologies to run warehouses smarter, smoother and more efficiently. “Our first day at CeMAT AUSTRALIA in Sydney has been a great success and the performance of our exhibitors has well and truly exceeded our expectations. “Walking around the show, you can see a fantastic line-up of exhibitors featuring technologies, products and system solutions that are ready now for the logistics market in this region and the rest of the world. CeMAT includes over 100 exhibitors on show for three days, a conference on day one, workshops on day two and industry site visits on day three. Key speakers from the conference today included Armin Weih, Deputy Managing Director of VDMA (pictured below); Nathan McKenzie, CEO of Speedshield Technologies and Ron Koehler CEO AU/NZ of DB Schenker. CeMAT will run for two more days – Wednesday 6 May and Thursday 7 May 2015.